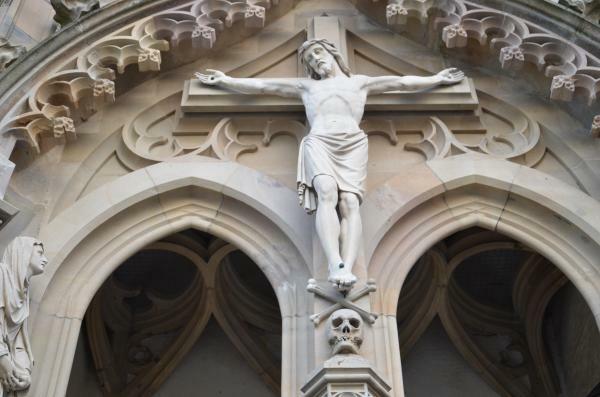 You may have never noticed the image of a skull on the base of a Roman Catholic or Eastern Orthodox crucifix. Certainly extremely unusual to the uninitiated. Possibly determined as blasphemous to others. The actual story is very interesting. You see, we know Christ was crucified at a place called Calvary, right? The word Calvary actually means the place of the skull. The location outside of Jerusalem where Christ was crucified was known by locals as The Place of the Skull and called Golgotha (why? We will get to that shortly…). The Bible references this name in MATTHEW 27:33, MARK 15:22 and JOHN 19:17. The common English name for the location of Christ’s crucifixion is known as Calvary. The word Calvary, which has to be the most popular church name ever (Calvary Chapel actually means Skull Chapel! ), appears only once in the entire English Bible (LUKE 23:33); and only in the King James Version and its various editions (there are a few modern versions which use the name of Calvary in the notes of their particular editions, but no other English Bible uses it in the text proper). 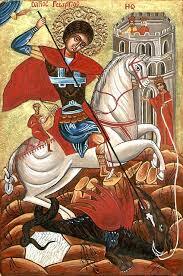 Further, the word Calvary is not a translation of the Greek word kranion (which means ‘skull’ and is translated as ‘skull’ in the English Bible), but is a transliteration of the Latin word Calvaria from the Latin Vulgate in LUKE 23 (which is a Latin translation of the Bible from Jerome in the fifth century. The King James Version translators added the Latin Vulgate to the several Greek New Testament manuscripts they used during the translation process from Greek to English. I do not know why they chose to translate a Latin word rather than the underlying Greek in this instance). Now back to Skull Hill. Rather than referring to that place directly as Skull Hill, the local population during the time of Christ called the place of the skull by the proper name they gave to it: Golgotha. You see, Golgotha is an Aramaic word which means skull that soon became a Hebrew word through avid use. Perhaps the locals preferred the name of Golgotha over skull because it wasn’t so overt as to be a sharp reminder as to what actually happened at that place. Sort of like the word Euthanasia which is an antiseptic word for killing. So why was the place of the Crucifixion called The Place of the Skull? = Calvary may have been a place of public execution, and so named from the skulls strewn over it. The victims were perhaps abandoned to become a prey to birds and beasts. = Its name may have been derived from a cemetery that may have stood near. = The name may have been used to describe the physical contour of the place (in certain lighting and from certain angles the location resembles a skull). = There was a tradition current among the Jews that the skull of Adam, after having been confided by Noah to his son Shem, and by the latter to Melchisedec, was finally deposited at the place called, for that reason, Golgotha. The Talmudists and the Fathers of the Church were aware of this tradition although I am unaware of the earliest date of attestation would be. But at the end of the day, regardless of the name speculation, I praise God for the gift which was birthed on Calvary so long ago.